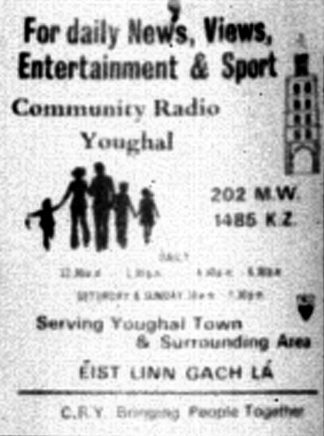 COMMUNITY RADIO YOUGHAL had been heard regularly during their night time transmissions on 1512kHz throughout the UK and parts of Europe during the winter months of 1980/ 1981. 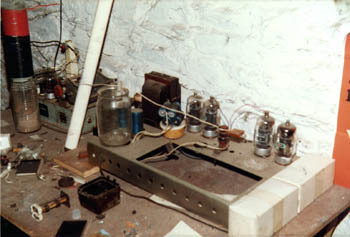 Problems however soon developed when the clear channel of 1512 began to be used by other stations, including Radio City in nearby Cork. Initially though C.R.Y. had some amazing long distance signals on the clear channel of 1512. As a long distance radio enthusiast, you always felt that you were hearing something quite exotic when Community Radio Youghal was being heard at night. Probably because of the exotic sounding name and accents. Click here for a pdf file of a QSL sheet received by Ian in 1980. This is quite high res. 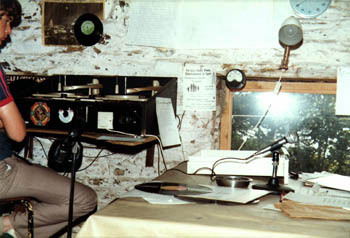 The dx archive team visited Community Radio Youghal in August 1981. In 2013 CRY 104 celebrated moving into new premises in town, and in 2014 they celebrated 35 years on the air. See below for links to various YOUTUBE interviews from 2013, including Mrs Eileen Connolly!!. 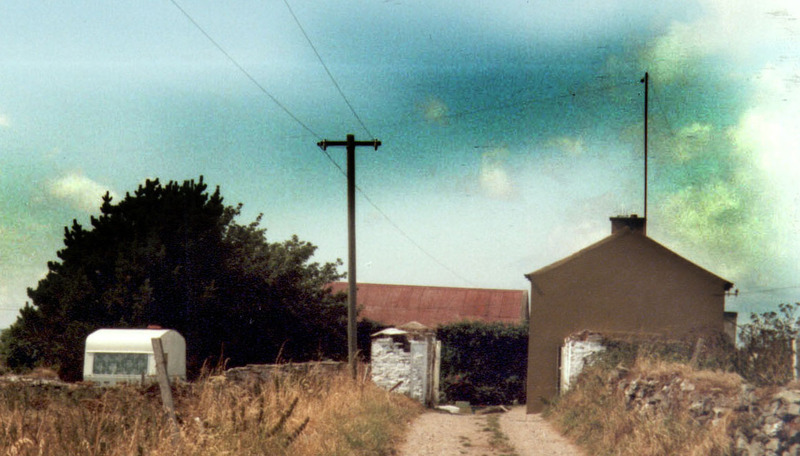 Left: A photo of the CRY farmhouse from 1981 as we approached the CRY location, showing the aerial mast on the right. 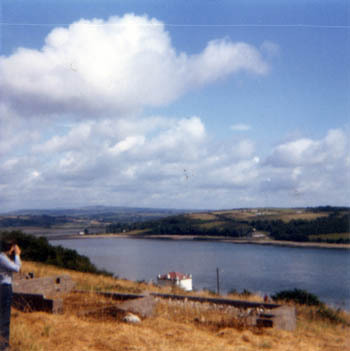 The aerial wire sloped from the mast down towards the trees to the left. and to the hedge area on the right. On the right, the CRY farmhouse slightly darkened to show the wire from the antenna coming from the mast. Question? Was the studio in the attic below the mast, or in the attic of the tin roofed building facing the camera? 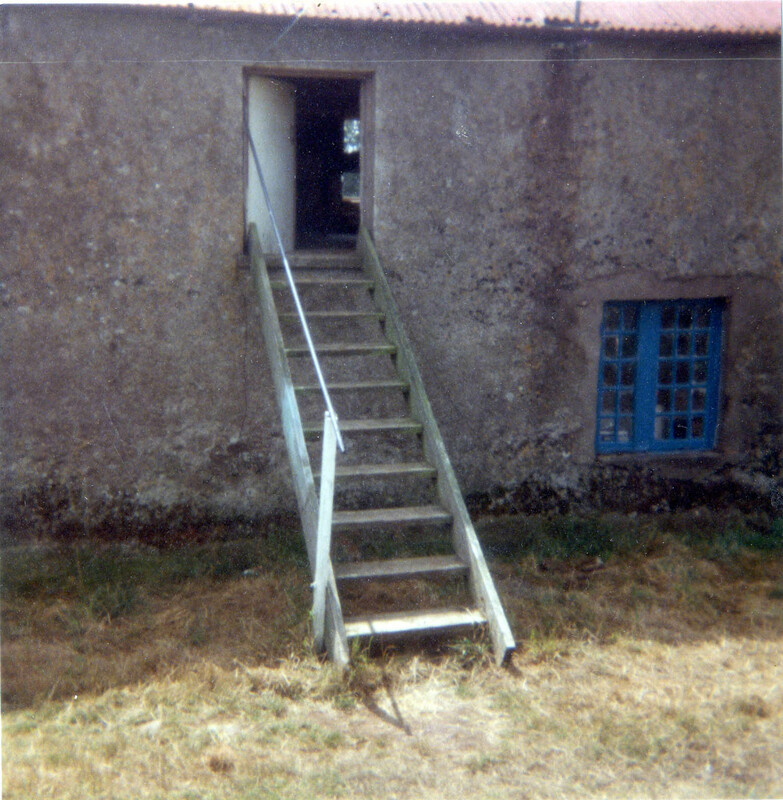 The image below of the old ladder up to CRY shows a red tin roof. So where did we get sent. 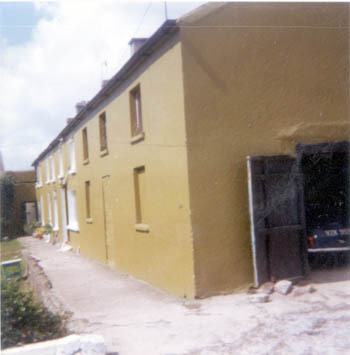 Through the garden and past the house, or to the right and all the way around the back. I seem to think it was to the right, and all the way around the back, but memories fail me slightly after all these years!! 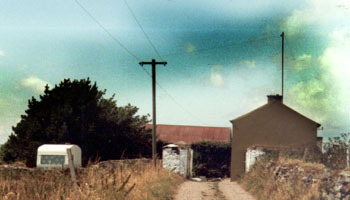 The farmhouse at CRY. 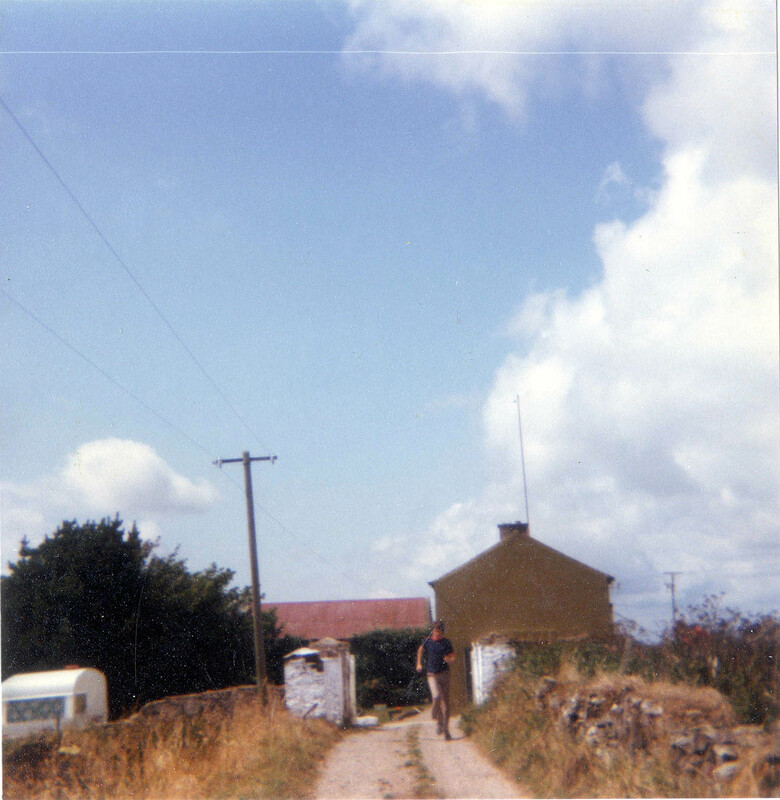 We were send around the back to the station by probably Eileen Connelly who had just come off air at the time. Right: The old steps up to the studio in the barn/ attic at CRY! 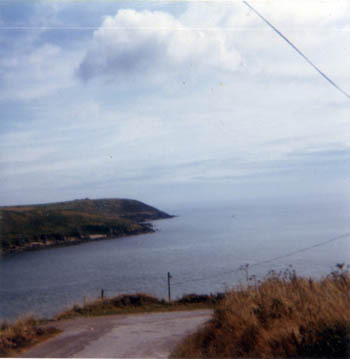 Left: The C.R.Y. 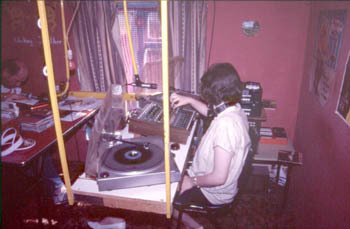 studio in 1981. 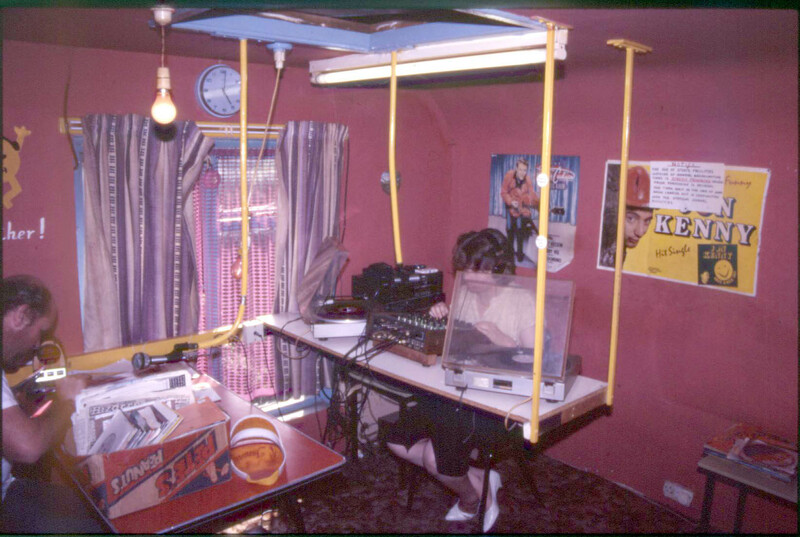 A blow up of the poster on the studio wall between the decks and the window gives a sched. The hours of transmission can just about be made out from this as daily from 11:30am to 1:30pm and 4:30pm to 6:30pm with weekends 10am to 7:30pm. 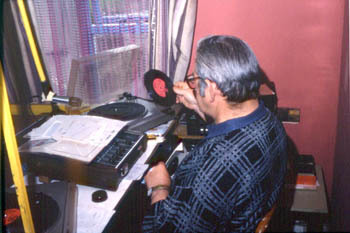 Right: The C.R.Y. amazing transmitter. This was heard across Europe on 1512. The valves are at the back, the glass at the front is an old "jeely jar".. lol..!! 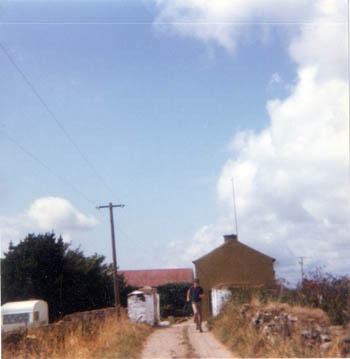 Community Radio Youghal farm, and the fellow charging down the lane after us as we leave, to tell me to write to the station manager for a QSL verification!! Sadly I never did write back, but Ian already had a QSL sheet from CRY. The beautiful postcard views from the road leading up to Community Radio Youghal. I am unsure how close Google can get on their street view to this area, or if we are still on a private road. 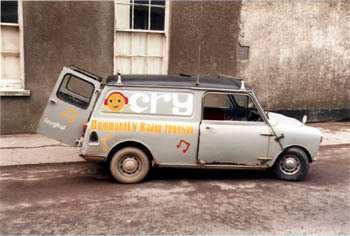 Community Radio Youghal mini van, photographed by Gary in 1985. 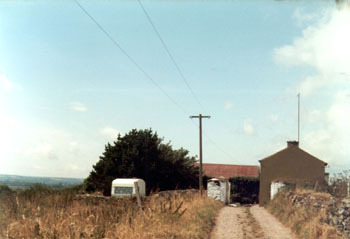 During a whistle stop tour of the Irish pirates in 1986, Steve West photographed only two images of the CRY studio, by now down in the town of Youghal. The MW transmitter was still up at the farm though, but wasn't seen this time around. Steve West also visited in 1987, and took a couple of shots in the studio, as well as a shot of the poster on the wall shown below. Amazingly both shots fail to show the girl's face that is doing the programme!! 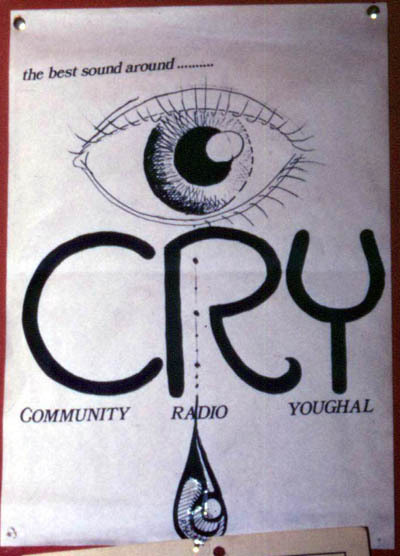 CRY is still on the air today, having been the station awarded the broadcasting licence for Youghal. 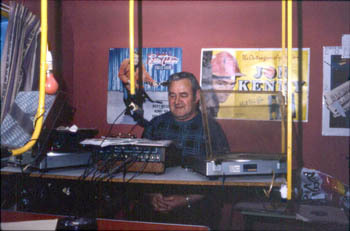 An old report lists them on 105.1, but nowadays they are known as CRY 104. In 2013 the station celebrated the launch of their new studios in town, and in 2014 were celebrating 35 years on the air. What a great pity they don't switch on the 1512 on a Saturday night or something these days, as the channel is again very clear. Eileen Connolly remembers the early days of Community Radio Youghal.